1-3-15: After 'depping' with us for a few gigs over the last couple of months Hayley has now joined us on a permanent basis as our lead vocalist - do come along a check out her out, she has a fantastic voice! 28-7-14: Not sure what we're doing to our bass players, but Paul has decided to leave us after a small but perfectly formed and enjoyable stint. Our new bass man Adam will make his debut in a few weeks at a favourite and regular haunt of ours, The Swan in Farnborough. The king is dead, long live the king. 15/3/14: Following the 'retirement' to Spain of our long standing bass player Pete (good luck mate, good job there's no extradition treaty in place) we are in rehearsal with out new fat-wire man Paul. First outing will be at The Cannie Man, Bracknell on 29th March. 27-9-13: Gigging with our new Vocalist, Kathryn, now and a few pics are up from our last gig at the White Hart - playing back the Cannie Man in Bracknell tomorrow 28 September - be glad to see any of our chums there? 31-7-13: It is with a deal of sadness that we confirm the departure from the band of our wonderful singer Rachel, who has now permanently relocated 'up north'. 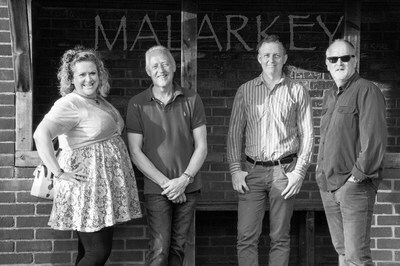 Our last gig with her will be at Chertsey Social Club on 10th August - do come along to mark the occasion if you can. Rachel has been with Malarkey since its inception around two years ago and we will all miss her amazing vocals and personality! For the rest of our gigs in August will be joined on vocals by Fabienne Tyler, whom some of us have been in a band with before. We are looking forward to re-igniting some of the fun we had back then and a big thank you to Fab for helping us out whilst be bring on-board Kathryn, our brand new singer. 29-3-13: Next gig is at The Red Lion in Godalming - a new venue for us, and booked at short notice - come along and see us if you get the chance. Might the first outing for Jem's new guitar!!! BTW - Checkout some new photos taken at a recent party we entertained at - cool! 27-10-12: Andy is now firing on all cylinders and will be making his debut performance on Friday 2nd November at The Cannie Man in Bracknell. Looks sure to be a fun-packed night!! Check out some moody snaps of Andy on the 'Look' page - band pics will be updated shortly. 22-10-2012: Unfortunatley we've had a cancellation by The Red Lion, Chobham where we were due to play on Friday 23rd November 2012. They're now under new management and the booking made in June 2012 now cannot be honoured. Hopefully we will re-book in the New Year.